Most Christians are familiar with a statement by Jesus that "the poor you will always have with you." Many faiths teach charity and compassion, that people of good conscience need to help the poor and try to raise them out of their poverty and need. » For information, call First United Methodist Church at 522-0397 or 522-9565. People may also make monetary donations to "H-5: Hawaii Helping the Hungry Have Hope" in care of the church. A lot of fine words are spoken on the subject from pulpit and political soapbox. 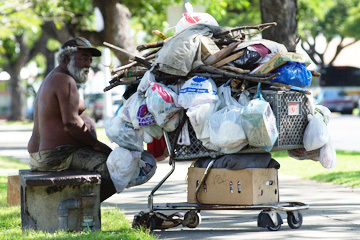 But there are as many as 10,000 homeless people on Oahu alone. On Wednesday, a band of believers will begin a 130-mile around-the-island walk to raise public awareness about homelessness. They hope to draw others to "Walk the Talk: Shelter the People" for a mile or a day or the duration. It will end at a Nov. 18 candlelight vigil at the state Capitol, the local finale of the nationwide observance of Homeless Awareness Week. "Walk the Talk" participants will march through Waikiki to share a glimpse of Hawaii that the tour industry doesn't touch, stop at parks around the island to hear the stories of people who live there, and talk to Oahu residents who just don't want the homeless in their neighborhoods and want "somebody" to solve the problem. Utu Langi described his brainchild to the monthly Open Table ecumenical forum Wednesday. He told the 30 attendees from a dozen faith traditions that the walk was generated by the H-5 project he founded at First United Methodist Church. Volunteers with H-5 -- Hawaii Helping the Hungry Have Hope -- cook hot meals at the church and deliver them to homeless people in parks and other places six days a week. Langi proposes that walkers collect donations or pledges to raise funds for his next plan, refitting an old tour bus as a mobile shelter. June Shimokawa, a retired social worker and Harris United Methodist Church member, is using an e-mail campaign to invite friends to join the walk or pledge a donation. "This walk will not address the systemic problem, but it gives the opportunity to raise the level of discussion," she said. "Every stop is a chance to meet people and begin to raise what the issues are, and to hear people's stories." Shimokawa, a veteran of social justice activism, said the goal is to "help people see that the personal is political, that there is a fundamental need for us as a society to see that everyone has shelter. It is unconscionable that not everyone has shelter because they don't have money. "The public picture of a down-and-out homeless man miscasts the entire homeless population. If we can get on the same page and know that it's not, 'This person is on drugs,' or 'That person has some personal characteristic,' as explanations for why they are homeless. Every family has a story; it's certainly not because they're lazy." Said Shimokawa: "After all, we are our neighbors' keeper." A homeless man gets kicked out of Pokai Bay Beach Park, where he was sleeping overnight, by the police. He takes his stuff and walks away. On Wednesday, isle church members will begin a 130-mile walk around the island to raise awareness about homelessness. Some members of the Open Table/Interfaith Alliance of Hawaii group Wednesday found a spiritual element in hitting the gritty route ahead. "It's a pilgrimage in solidarity with the kind of people Jesus was most in tune with," said Jerry Madison of Christ Church Uniting in Kailua. Langi said he thinks the walk will be "a kind of spiritual retreat for me personally." Reynold Feldman, a Catholic teacher, said the concept of walking in meditation or prayer is part of many spiritual traditions. It can be a pilgrimage to special places, or "you could reclaim your everyday walk as an act of devotion." He said it's an uphill path for "Walk the Talk" in the current social climate of Hawaii. "Our state is supposed to be in the best economic place in decades -- low unemployment, high house sales. Yet we accept 5,000 to 10,000 homeless as an irreducible mass. It doesn't seem to be the will of the public. "As long as public sentiment is help-our-neighborhood vs. help-our-neighbor, homelessness will be with us," Feldman said. A homeless man sits at a bus stop on the corner of Ward Avenue and Kapiolani Boulevard. "Walk the Talk" participants will march through Waikiki and stop at parks to hear the stories of the people who live there. The Rev. Bob Nakata, pastor of Kahaluu United Methodist Church, said the walk's first lap through Waikiki will put the face of poverty in a significant perspective for visitors and the tourist industry. He said some visitor industry businesses contribute blankets and food, but "at a time when the industry is doing well, maybe it's time the industry is doing more for people suffering in homelessness." The former state legislator would like to see government, with businesses' cooperation, work to "stabilize" the homeless population, designating park areas for them, organizing the homeless to maintain park areas they use and providing a security watch. Agencies that provide health services and assist the homeless in job searches would be more effective "if from day to day you know where they are, rather than they suddenly disappear," Nakata said. Nakata told the Open Table gathering that a city official told him "for every sympathetic call we get, we get 100 wanting us to get them out of our community." "Recently I've felt that the aloha in our state is disappearing." Whether they viewed "Walk the Talk" from the spiritual or practical perspective, the planners agreed that the best they hope for in this beginning step is to make government, private business and residents who are blessed with roofs over their heads recognize that the poor are indeed with us. "It is about us; not one group or even the city and county can take care of it," Langi said. "It is a community dilemma, and until the larger community faces it, it can't be solved." Utu Langi, right, and other volunteers pray before preparing food they will deliver to homeless people. 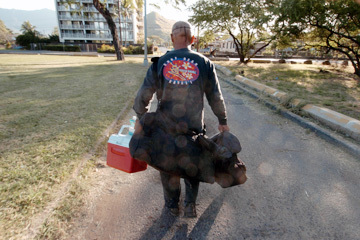 The H-5 program serves more than 2,000 meals a month around Oahu. Mary Adamski covers religion for the Star-Bulletin. Email her at madamski@starbulletin.com.